Gov. Mitt Romney announced his Presidential bid at the Henry Ford Museum in Dearborn, Michigan. Shortly after Mitt Romney's victory in Michigan, NJDC Executive director Ira N. Forman remarked, "If Republican voters in the rest of the country go the way of Michigan, they will vote away their chance at making any serious inroads among Jewish voters in November. Indeed, Jewish voters will surely not look kindly on Mitt Romney's efforts to ban stem cell research in Massachusetts, his opposition to Roe versus Wade, or his decision to use a line-item veto to prevent Jewish nursing home residents from receiving Kosher meals. "Romney has made several questionable decisions on the campaign trail, which call into question his understanding of the concerns of Jewish voters. For example, Romney declared for the Presidency at the Henry Ford Museum and refused to acknowledge his mistake after Mr. Ford's history with anti-Semitism was called to the public's attention. He also made the preposterous statement that America should look toward Hezbollah's social programs as a model." Mitt Romney is currently an anti-choice candidate who has sought support from the religious right in order to gain a competitive edge in the GOP presidential primary. Romney opposes stem cell research and tried to ban it in Massachusetts. The Anti-Defamation League and American Jewish Committee have criticized Romney for campaign rhetoric that undercuts the separation between church and state. Reports The Forward: "Both the Anti-Defamation League and the American Jewish Committee raised concerns about parts of [Romeny's] speech seemingly designed to help sell the former Massachusetts governor to conservative Christian voters . the speech 'reflected an effort we have seen in the current campaign - indeed on the part of many of the candidates - to appeal to religious voters on the basis of shared religiosity,' wrote Abraham Foxman, national director of the ADL." Romney said that Pat Robertson "has a dedication to strengthening and then nurturing the pillars of this community and our country: education, fellowship, and advancement." Romney's comments came during an address at Regent University, to which he went to court support from the religious right. Mitt Romney announced his candidacy for President at the Henry Ford Museum and refused to apologize or change venues after Ford's anti-Semitism was brought to his campaign's attention. Romney said that Hezbollah's "kind of diplomacy is something that would help America become stronger around the world ." Romney was seemingly unaware that Hezbollah's social programs are inseparably tied to terrorism, that the health clinics and schools praised by Romney have also been used as a cover for rockets launched at Israeli cities, and that Hezbollah social activism has included paying "bonuses" for the murder of Israelis. In Massachusetts, Romney used his line item veto to oppose $600,000 in funding for kosher meals to Jewish seniors. 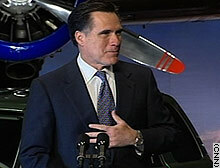 Romney's veto was overridden by the Massachusetts General Court (state legislature). Romney made a questionable reference to "Hitler's Holocaust Ovens" on the campaign trail. In discussing the War on Terror, Romney "called the Democrats "uncomfortable in recognizing the evil in the world,' and said, 'I don't think the world has seen the face of evil like this since the days of Hitler's Holocaust ovens.'"